Cars that were made to get dirty are happiest in their natural habitat: a wet, muddy road. A dusty, rutted path. A gravelly street. A dingy river crossing. 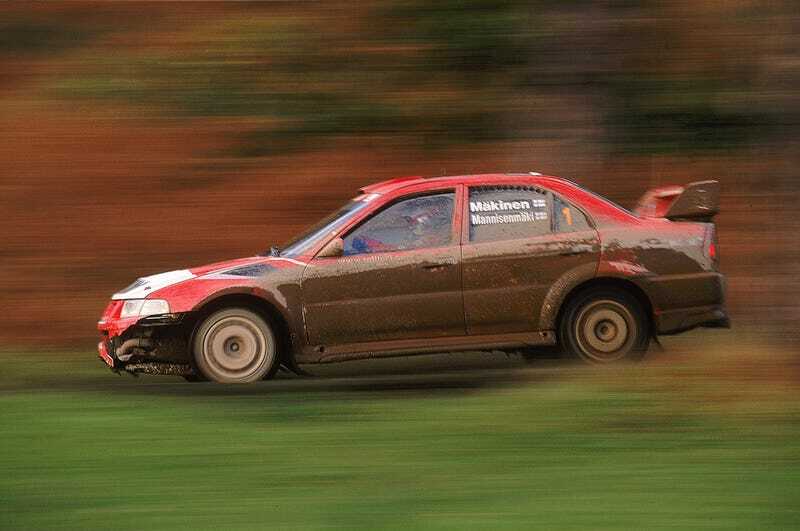 Here are the ten cars you thought look the best dirty. What Vehicle Looks Great Dirty? This is Answers of the Day - a feature where we take the best ten responses from the previous day's Question of the Day and shine it up get it real muddy to show off. It's by you and for you, the Jalopnik readers. Enjoy! Why It Looks so Good: Our love here at Jalopnik HQ for the Raptor is pretty well documented. The truck is pretty much straight up, unadulterated awesome. Able to go leap tall dunes in a single bound? Check. Cruise at 60 mph over deserts? Not a problem. Look badass? Got it taken care of- even more so when covered in dust from a day of play. Why It Looks so Good: Russia's favorite small SUV looks horribly out of place anywhere else but the road less traveled. Whether it's been race-prepped or just has a winch stuck on the front end, it's pretty much ready to take on whatever terrain you throw at it, and it doesn't mind getting messy in the process. We like it because it's built like a tank and wears dirt like a second skin. If it's good enough for Vladimir Putin, it's good enough for us. Why It Looks so Good: Along with its Subaru nemesis, the Lancer Evo fights for dominance off-road. And, like its opponent, it doesn't really look right unless it's covered in mud. So here, for your enjoyment, a RallyAmerica competitor, doing what they do best behind the wheel of an angry Evo. Why It Looks so Good: BtheD19 specified WRXs, but we're fans of all the rallying Imprezas, whether they were run by the Subaru factory team in the mid-1990's by the late great Colin McRae or cars that are still out there now, fielded by amateur teams driving the snot out of them for the sheer thrill of it. There's something right about a blue car with that bright yellow swoop and logo down the side, caked in dirt and mud, regardless of what era it's from. Why It Looks so Good: The original Humvee was made to do one thing, and one thing only: not get stuck. Anywhere. Under any circumstances. So it goes without saying that if's equally at home on some unpaved, flooded out back road in Tennessee as it is in the deserts of Iraq. Nothing stops these things, especially not a little mud. Or four feet of water. Or enemy fire. Why It Looks so Good: Usually we see old-looking hot rods, belly tankers, or flat-out speed record cars on the salt flats. And those cars always look cool, covered in layers of salt dust kicked up at hundreds of miles an hour, but it's when something totally unusual takes to the dried lakebed that magic happens. When the BAR Honda F1 team took their car to the Flats a few years ago, it was an awesome event. The car looked cool, it went fast, and got real dirty. Up until then, I don't think a Formula 1 car knew what salt was. Why It Looks so Good: Much like the Hummer, the original Jeeps were made to get the Army where they needed to go, no questions asked. Now, also like the Hummer, the civilian version does the same duty, albeit with less hostile fire to watch out for. Still a favorite amongst those who know, the Jeep is perfectly at home cruising on road or off, though it's easy to see that they prefer the dirty stuff. Why It Looks so Good: When you think of vehicles you'd want to drive through unfriendly jungles, what comes to mind first? Probably a Land Rover. The generation or exact model isn't necessarily the same for everyone, but it's always got that little green badge on the front. That's because they take to dirt like fish to water. Why It Looks so Good: For those not in the know, Porsches look odd on anything other than a paved road course. To the rest of us, a 911 carving up a gravel-or-dirt-covered road is par for the course. What's really cool is seeing one of the Dakar-spec 959s doing its thing. Though they were never really competitive, being prone to technical difficulties, they looked damn cool out there, jumping over hills and valleys and covered in desert dust. Why It Looks so Good: There are few things better than a rally-prepped vintage Stratos. (Isn't it great that we now have to clarify old or new when talking about Stratoses?) One thing is a Stratos in full opposite lock, sliding around a turn in full-attack mode. The other is a Stratos doing these things, while covered in a layer of grime. Like pigs in mud, there's nothing happier than a sliding, dirty Lancia.